Citrus × meyeri, the Meyer Lemon, is a citrus fruit native to China thought to be a cross between a true lemon and either a mandarin or common orange. It was introduced to the United States in 1908 as S.P.I. #23028 by the agricultural explorer Frank Nicholas Meyer, an employee of the United States Department of Agriculture who collected a sample of the plant on a trip to China. The Meyer lemon is commonly grown in China in garden pots as an ornamental tree. It became popular as a food item in the United States after being rediscovered by chefs such as Alice Waters at Chez Panisse during the California Cuisine revolution. Meyer Lemon trees are around 6 to 10 ft (2 to 3 m) tall at maturity, though they can be pruned smaller. Their leaves are dark green and shiny. The flowers are white with a purple base and fragrant. The Meyer lemon fruit is yellow and rounder than a true lemon. The skin is fragrant and thin, coloured a deep yellow with a slight orange tint when ripe. 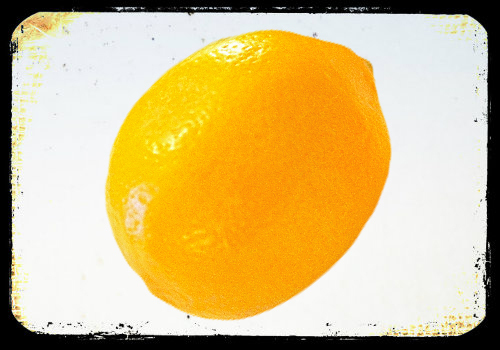 Meyer lemon fruits have a sweeter, less acidic flavor than the more common Lisbon or Eureka grocery store lemon varieties. The pulp is a dark yellow and contains up to 10 seeds per fruit.